Our classes promote sensory and physical development, imaginative and cooperative play and encourage parent and child bonding in a friendly and social environment. Babies and infants develop an awareness and understanding of their environment by using their five senses: hearing, smell, taste, touch, and vision. Through play incorporating these senses, babies and infants learn and their neuro developmental pathways develop and mature, promoting cognitive development. More practically, it allows them to gain an understanding of the world around them. Young children learn best when they can experience new things with all of their senses; they need to see, hear, feel, touch, smell, and sometimes even taste things in order to understand it fully. Our Bambeenies, Teenie Beenies and Big Beenies classes have been carefully created to stimulate vision, listening and sense of touch. Imagination is the ability to form a mental image of something that is not perceived through the senses. Play which captures the imagination helps your child to understand the power of language and can provide them with a variety of problems to solve which calls upon important cognitive thinking skills. Imaginative play is not just for fun, it is a developmental process where life skills are learned. 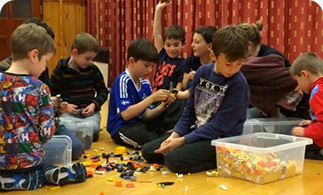 Not only do our Bambeenies, Teenie Beenies and Big Beenies classes allow children’s imaginations to run free, they also encourage the development of cooperative play. This allows children to learn how to take turns, share responsibility and problem-solve creatively. These are all important skills which can and should be developed at an early age. Bonding is the intense emotional relationship that develops between parents and their child. A strong bond is a key factor in the way that your child’s brain develops and influences their social, emotional, intellectual and physical development. 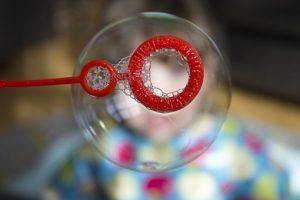 It also forms the foundation of your child’s ability to connect effectively with others and understand and respond to others. These qualities are vital in their relationships as they grow up. 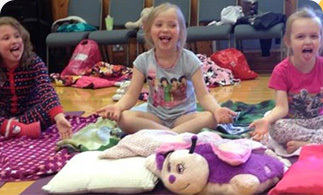 Our classes encourage the strengthening of relationships through play and relaxation. 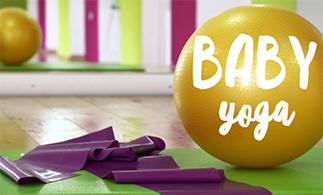 In particular, our Bambeenies class helps you to make the most of that crucial one-to-one time between parent and baby, in a fun and relaxed atmosphere. Through a parents loving touch, babies receive many physical and emotional benefits and gain confidence and closeness with their parent. Bonding with your children is easiest and most enjoyable if the people around you are supportive and help you develop confidence in your parenting abilities. Taking care of children can be overwhelming at times and we can all benefit from the emotional support of family and friends. Children copy their parents. If you are having fun, meeting other parents, interacting and sharing your feelings and experiences, your child will do the same. Joining one of our classes will not only develop your child’s skills and aid their development, but it will encourage social skills in a caring, supportive atmosphere. Your child’s ability to hear should be fully developed by the end of their first month. But it will take longer for your child to understand and respond to all the sounds that they listen to. 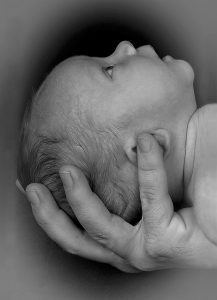 By 3 months, the part of your baby’s brain which processes hearing, language and smell will be more receptive and active. 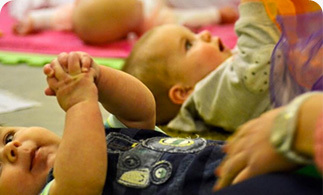 Our lively Bambeenies, Teenie Beenies and Big Beenies classes encourage this development by incorporating interactive singing and music, introducing a variety of sounds from ticking clocks to the sound of wind chimes. Babies crying and tantrums are often an expression of frustration at not being able to communicate. The introduction of basic sign language in our classes and listening to the voices of their parents and other people all helps to improve their language and communication skills. Taste and smell are the two most closely related senses. 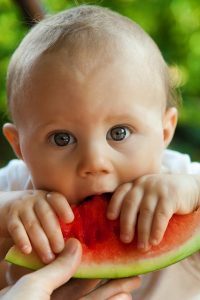 A newborn baby can distinguish between sweet, salty, sour and bitter tastes. They immediately show a preference for sweeter tastes. Your child will achieve a full sensitivity to taste by around 12-19 months. 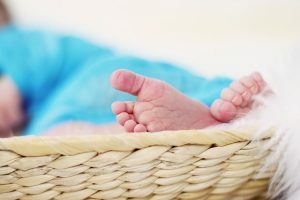 As for smell, a newborn’s sense of smell is so acute that they can already tell the difference between the smell of their mother’s milk and that of another mother. Our Bambeenies, Teenie Beenies and Big Beenies classes use a range of textures and smells to build upon their already developing senses. Exploration is a crucial part of early childhood learning, whether it is touch, smell, taste or other means. Specially selected items can be explored in their mouths and hands. The outdoor smells of herbs, flowers and foodstuffs will be brought indoors to be touched, smelled and tasted. The term touch is used to describe the physical sensations that can be felt through the skin. Touch is integral to your child’s understanding of their surroundings and people around them. Shortly after birth your child will be able to distinguish between hot and cold temperatures and feel pain. 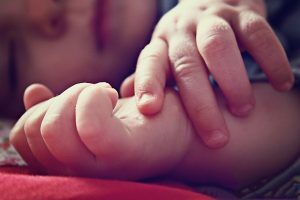 Your child’s hands and mouth are especially sensitive to touch. Between 1 and 9 months they will distinguish differences in textures with their hands and mouth. 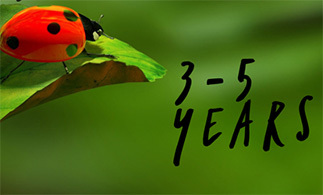 Between 3 – 4 years, they can also distinguish size and shape difference by touch. Our Bambeenies, Teenie Beenies and Big Beenies classes support this development through a range of sensory equipment, feathers, various materials and physical contact. By touching different textures and shapes, it helps them to create a mental image that helps them identify what it is. 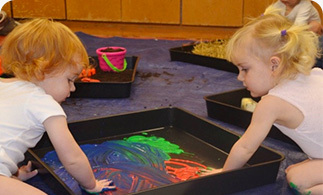 Playing with sensory equipment also helps with the development of their fine motor skills and improves coordination. 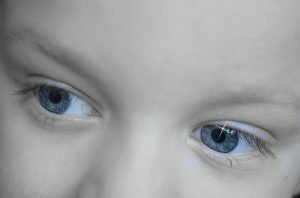 A newborn’s vision is fuzzy at birth, though they can make out light, basic shapes and movement. In the first month, they will be able to focus on objects 20 to 30 cm away. By the time they reach 1 to 2 months old, they may have learned to coordinate the focus of both eyes and see colour. By around 8 months, their vision is almost fully developed. By 12 months, your child has depth and perspective and can tell the difference between near and far. Our Bambeenies, Teenie Beenies and Big Beenies classes help support the development of our children’s sight in a number of ways. We carefully select contrasting colourful equipment and visually striking surroundings to support your child’s development. Our mirror play also helps children to focus, track images and create self-awareness. Studies show that children; especially babies, prefer the human face to all other patterns and images, so we develop activities which encourage you and your child to bond by letting them study your facial expressions, encouraging that closeness. Here is a list of some of the popular toys and equipment we use in our classes. This piece of equipment always proves popular in our classes! Babies, toddlers, mummies and daddies are all mesmerised by the colourful light show. Kids (and adults) love these light up smiley balls. These balls can be used to promote tactile awareness, hand-eye coordination, motor skills and visual tracking. Stimulate the senses through exploring different shapes, sizes and textures. Colourful toy and great for bathtime! They encourages motor skills and hand-eye co-ordination. Please note that this item is not a toy and supervision is required at all times. We provide fun and interactive classes for children aged 0 - 10 years. Join our mailing list to ensure you don't miss out on any of the fun!